The first time a mother holds her baby the journey of protection begins. And for most, the model for care of her child is established in the hospital. Introducing the revolutionary HALO® Bassinest® swivel sleeper for Hospital Birth Centers - a new concept in the world of bassinets. 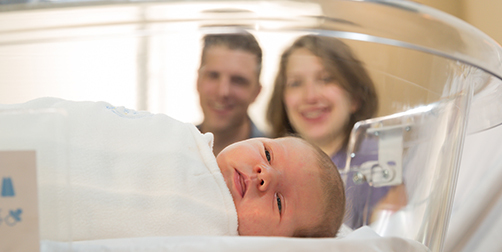 It’s the only hospital bassinet designed to safely keep baby closer to mom than ever before, enabling the closeness that a mother desires most in the first moments with her child. Empowering her to easily care for her child. Promoting ‘skin to skin’ bonding. Reducing nurses' time to support baby’s care. Providing baby a safe sleep environment & modeling safe sleep practices for parents. The HALO Bassinest is the ideal bassinet to ensure safe, comfortable & enjoyable experience for families during their stay at your Birth Center. Ideal for all mothers, but especially those recovering from a C-section or with physical disabilities. Promotes mother-centered care and safe rooming in by reducing the likelihood of accidental falls/drops. Space-saving tuck under design provides convenient, easy access to baby from bed. Design empowers mother to care for her baby, limiting nursing time needed to support baby’s care. The Bassinest Swivel Sleeper fits easily on either side of mother's bed. Clear, lowering bedside wall makes it easy to see and tend to baby while in bed. Designed for unsupervised rooming-in scenarios, the bedside wall can easily be locked in the upright position. Supports breastfeeding and mother-child bonding. Now your little one can sleep as close to you as you want - even right next to you in bed - and still sleep safely in his own separate space. And the more it moves, the less you have to - which makes taking care of baby throughout the night a lot easier. 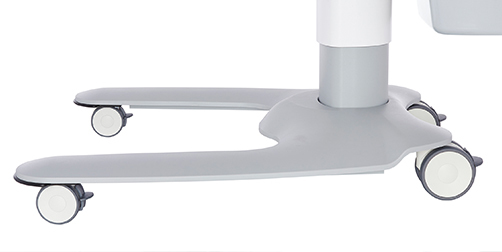 Height adjustable base provides ideal positioning for mother-to-child closeness, regardless of bed height and makes vital checks easy for nursing staff. Models a safe sleep space for baby. Provides baby his own safe sleep space to encourage safe sleep practices in the hospital and at home. Locking caster wheels for easy maneuvering. Provide newborns a smooth, quiet ride, while providing stability and maneuverability during transportation. Built-in storage to keep baby’s necessities at mother's fingertips. Designed for unsupervised rooming-in scenarios and for the safe transport of baby, the bedside wall can easily be locked in the upright position. Unlike any other Bassinet, its clear bedside wall lowers to give mother easy access to her baby, and automatically returns for safe sleep. The secondary interior wall provides an additional layer of safety beyond the exterior wall. 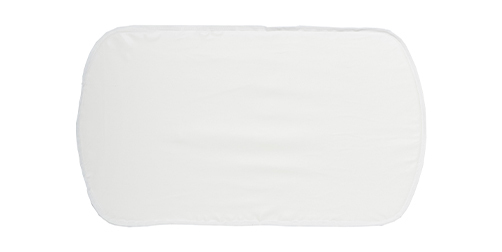 Each Bassinest includes a firm, waterproof mattress and tightly-fitted sheet that align to safe sleep recommendations. Mattress is wipeable and easy to clean. Make it easy to see, bond and tend to baby from bed. 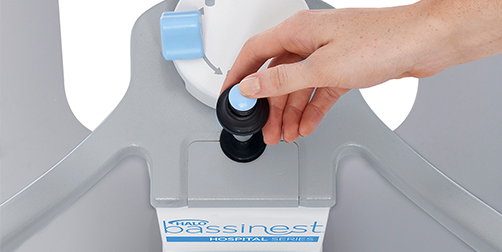 Designed with longevity, stability and safety in mind, the Bassinest can withstand the pressure of industrial use. The bassinet tub can accomodate 450 lbs of downward force and the tub sides can accomodate 100 lbs of suspended weight. Ideal for rooming-in with its space-saving, tuck-under design, easily rolling under any bed in its lowest position. The design can accomodate space for the bedside tray table under mother's bed. Locks bassinet tub in place to ensure safe transport of baby. 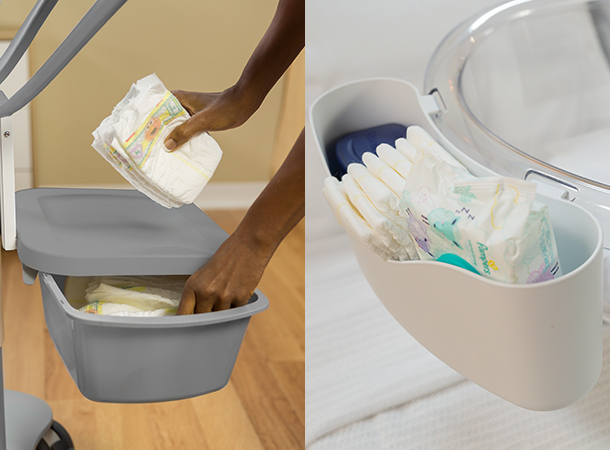 Two removable storage caddies keep baby's essentials with in easy reach for mother and healthcare staff. Height adjustable base provides ideal positioning for mother-to-child closeness, regardless of bed height. Mother can adjust the height higher by pushing up anywhere on the bassinet tub. To lower, mother simply engages the height adjust knob. Covered storage for baby's essentials. Ample room for clothing, wearable blankets, diapers and more. Designed to accomodate a standard wash basin. 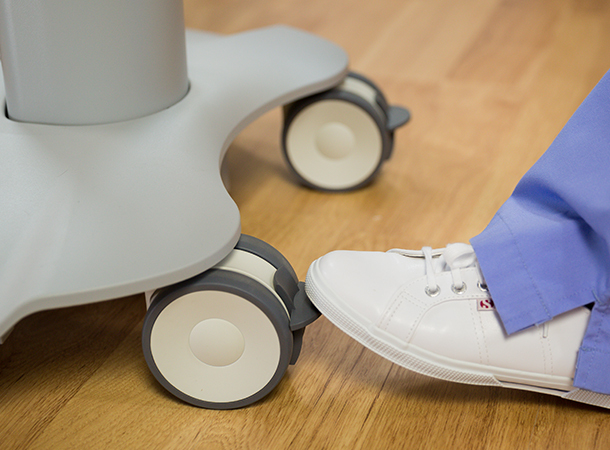 Allows for easy maneuvering during transportation so mother can use as a walking assistant. Can accomodate 300 lbs of downward force. To learn more about the Bassinest, please contact a HALO Account Manager at 888.999.HALO or complete our online form. For product support, please contact customer service at 888.999.HALO or email bassinestsales@halosleep.com.